Sharon, Jack and I headed to the East Bay for the day. 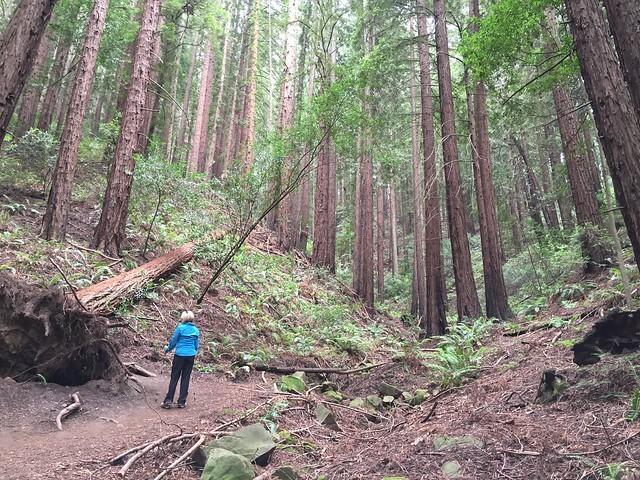 The plan was to hike in the Redwood Regional Park. After a stop for sandwiches in Lafayette, we got to the Skyline Gate Staging Area about 11:30 am. We ended up hiking almost 7.5 miles. We took the West Ridge Trail to the French Creek Trail. We followed the French Creek Trail for three miles. We then took the Chown Trail back up to the West Ridge Trail. We followed the West Ridge Trail past Redwood Bowl and made a quick stop outside the Chabot Space and Science Center before continuing to the car. We were back at the car about 3:15 pm. There are a number of nice stands of second growth redwoods along the trail. Nevertheless, both Sharon and I were disappointed with the view; we were expecting to get some views of the bay and San Francisco, but never did. I was also amazed at the number of dogs. As Jack pointed out, on the French Creek Trail, we would see the dogs come around the corner on the trail before we saw the people. The traffic on the way back to Carmichael was heavy. We didn't get home until about 6:15 pm. A Google Map and a view in Google Earth of the hike are here.